“Ancient Capital of Gaul”, yes, “the Gastronomic Capital of France”, certainly, but Lyon, France’s third largest city and second largest urban area is so much more. I came to Lyon for a student exchange program and never looked back. The city’s beauty and quality of life completely seduced me. Paris is certainly knock-out beautiful, but, a bit like New York, I wouldn’t want to live there. Marseille has, let’s see, well it has the Mediterranean Sea at its feet, if you’re into that kind of thing. But among these three biggies in France, only Lyon gets the dosage just right. 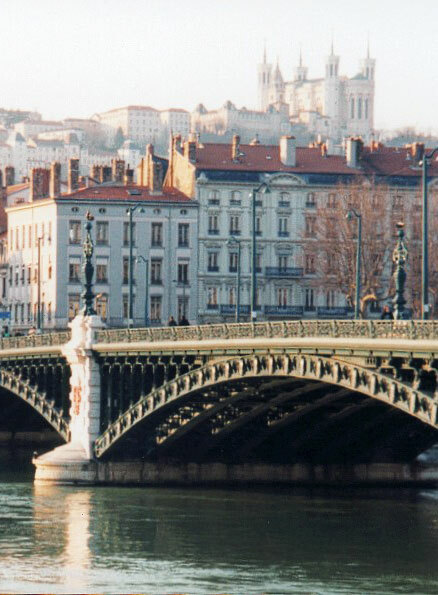 I’m fond of saying that living in Lyon is like having all of the advantages of Paris without the inconveniences; it’s a big, beautiful, culturally, historically and modernly important city, that has managed to stay human. Everytime I come back to Lyon from a trip to Paris or Marseille, I have the feeling of rediscovering the sky above my head. Lyon is a big city that doesn’t crush you. The next time your in France, give yourself 3 or 4 days here, and you’ll go away as inspired as this guy did. The Lyon Office of Tourism This link goes directly to the English site. This section of Wandering electrons is a work in progress, so come back often!